Over the past few years, I have tried to join in with a number of other ladies on one of the yahoo groups I am on with starting some new projects in the hope that they will be finished that year. I think I have yet to complete even one project! But never mind, others do get completed during the year. LOL. This year I chose 4 projects to start on New Years Day, but as we did not return home from my SIL’s until late in the day and I was absolutely exhausted, then we had another 2 days of barbeques that we were either hosting or attending, I did not get to do ANY cross stitch until the 4th. And here they are. I started with Ellen Myerscough. Ever since I first got her for the shop, I have been wanting to stitch her. I am stitching her using the NPI Silks and Belle Soie that are suggested in the chart, but have changed the fabric for 32ct Sandpiper from my stash. If I remember correctly, Sandpiper is a Birds of a Feather fabric, now produced by Linens by Design. 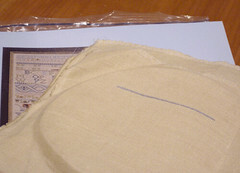 I have started on the border, and have stitched one length of thread. 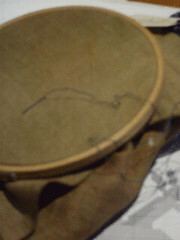 I am stitching it over 2 using 1 strand of silk. 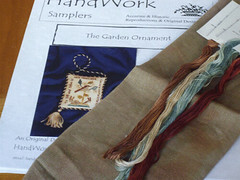 Handwork Samplers’ “The Garden Ornament” is a chart that I have had in my stash for about 7 years. I love it as much as I did when I first saw it online, probably on the Tapestry of Dreams or the Wyndham Needleworks website, many years ago. 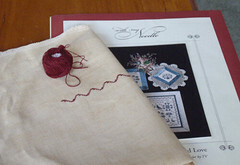 When I attended the final Sampler Gathering in Plymouth Massachusetts in 2003, I purchased the 36ct Meadowlark Linen from Birds of a Feather from The Sampler, where they had the completed ornament on display. I have been meaning to start this chart ever since. I think that one of the things that has been putting me off is the fact that it is stitched over one. I don’t have a problem with 28ct or 32ct linen, but on 36ct linen it is more scary! LOL. This design is stitched using Sampler threads. 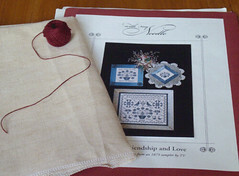 I love the colour of the linen, it has a lovely rust colour going right through it. I was not able to complete a full strand of thread, as the light was fading, and I have recently found that I really do need to have a decent floor lamp for my stitching! But here is the after picture… Sorry it is blurred, but I just could not get a decent picture of it! That is about 1 inch (2.5cm) of stitching! Sometime between when it was released in 2002 and mid 2004, a very good friend of mine gave me “Tokens of Friendship and Love” as a gift. 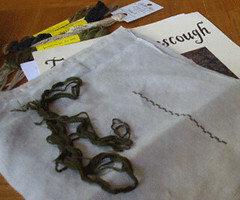 Since then I have imagined stitching it in The Thread Gatherer’s “Mediaeval Mulberry”(one of my favourite colours! ), but a couple of weeks ago, when I decided that it was about time that I started this design, I changed my mind! At first I was going to stitch it in Belle Soie’s “Rose of Sharon”, but when I went to start it on Monday, I decided to use a Valdani thread instead! Tokens is being stitched on 36ct Light Espresso from R&R Reproductions, another fabric that I have in my stash (gee, I am really using up a lot of my stash this year, aren’t I?) 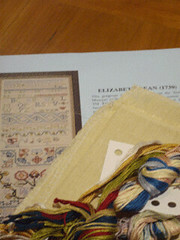 As well as the initials from the stitcher, there are 16 other sets of initials. I am seriously considering using the initials of my stitching friends, those who mean a lot to me, such as Ria, Annemiek, Candy, Jantine, Wendy among others. Of course, I need to include my DH’s initials, as, although he has never stitched with me, he has tolerated my obsession with cross stitch for 18 years. 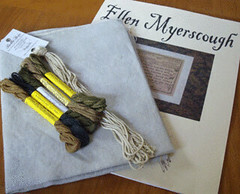 A long time ago, I joined the e-newsletter “With My Needle and Pen” organised by Ellen Chester of “With My Needle”. Each year, 2 (and sometimes 3) projects are chosen, with members deciding which ones they want to stitch. Elizabeth Dean from The Essamplaire was chose quite a few years ago. I got as far as to sort the threads, if indeed they needed sorting, and no further. I have decided that this year is the year for Lizzie Dean, and started her on the 4th of January. I need to locate my spare Artisan Lokscrolls before I go any further, as I do not like stitching in hand, and I don’t think she should be stitched using a hoop or with q-snaps, but then again, I may be able to get away with using the q-snaps. Let’s see how many I get finished this year! I just stumbled on your blog–wow–what an impressive set of starts you have! Thank you. I will definitely keep you updated on Tokens. I am focusing on ABC Christmas at the moment, but as this one is monochromatic, it may get worked on earlier than expected. I did not see the part you revered to but stumbled upon my name ;-). thank you!